TLJ Daily E-Mail Alert No. 2,356, March 25, 2012. Sunday, March 25, 2012, Alert No. 2,356. 3/22. Rep. Eliot Engel and others introduced HR 4247 [LOC | WW], the "Cell Phone Theft Prevention Act of 2012", a bill that would require service providers to not provide service to a stolen phone. Rep. Engel (at right) stated in a release that "It makes no sense to reward the thief by continuing service on a stolen cell phone. It's simple common sense to say the victim of a crime isn't responsible for service they are no longer receiving. If service is cut off on a stolen phone, it just becomes a useless brick." First, the bill would mandate that service providers not continue to provide service to a stolen phone. The phone owner would have to first file a complaint with police. The bill would add a new section to the Communications Act that provides that "A provider of commercial mobile service or commercial mobile data service may not provide service on a mobile electronic device that has been reported to such provider as stolen", either by "the person who holds the account with respect to such service, if such person submits to such provider a copy of a report made to a law enforcement agency regarding the theft", or by "by another provider of commercial mobile service or commercial mobile data service". Second, the bill would also require services providers to enable phone theft victims to erase data on their stolen phones. It provides that "A provider of commercial mobile service or commercial mobile data service on a mobile electronic device shall make available to the person who holds the account with respect to such service the capability of deleting from such device, from a remote location, all information that was placed on such device after its manufacture." To enable these mandates, the bill would require that any covered device manufactured in, or imported into, the US contain a unique identifier. This bill would cover cell phones, smart phones, tablet computers, and any other devices for which commercial mobile service or commercial mobile data service is provided. However, it would exempt prepaid service, and any service for which "the consumer does not have a direct relationship with the provider of commercial mobile service or commercial mobile data service". The bill would not take effect for two years. The bill was referred to the House Commerce Committee (HCC). 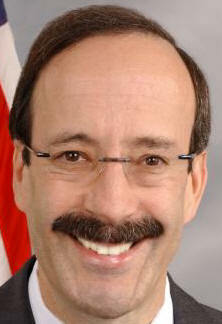 Rep. Engel is a member. The two original cosponsors are Rep. Jerrold Nadler (D-NY) and Delegate Eleanor Norton (D-DC). See also, related story in this issue titled "House Commerce Committee Democrats Question Companies Regarding Smart Phone Theft". 3/23. Rep. Henry Waxman (D-CA), Rep. Ed Markey (D-MA), and Rep. Anna Eshoo (D-CA) sent similar letters to communications carriers, handset manufacturers, and operating system developers regarding what they are doing, or could be doing, to combat rising theft of smart phones, and protect consumers from theft of personal and financial information. See for example, letter to Apple. See also, related story in this issue titled "House Democrats Introduce Bill to Enable Service Blacklisting and Data Erasure for Stolen Mobile Devices". The three are senior members of the House Commerce Committee (HCC). Rep. Waxman is the ranking Democrat on the HCC. Rep. Eshoo (at left) is the ranking Democrat on the Subcommittee on Communications and Technology. They wrote that theft of smart phones has increased. Then, "Thieves erase subscriber identity in formation and resell stolen phones for pro fit or use these phones to commit other crimes. The information on the stolen phones might also be utilized for nefarious purposes." They added that "Without the ability to lock or wipe cell phone memory, victims of cell phone theft not only have to worry about replacing their device, but are also at risk of having their personal and financial information stolen." Also, "These incidents of theft raise important questions about what role wire less providers, operating system developers, and handset manufacturers might play to combat cell phone theft and protect the personal and financial in formation stored in wireless devices from falling into the wrong hands." The letters then propound numerous interrogatories, to be answered in writing by April 11, 2012. For example, they state that "Law enforcement and others have suggested that the ability to disable remotely mobile devices would reduce or eliminate resale value and thus lessen the incentive for cell phone theft", and then ask, "What are your views on this technology as a deterrent to theft?" They also ask, "If your company has knowledge that a specific phone has been reported stolen, do you allow such a phone to be subsequently reactivated with a different phone number?" See also, HCC Democrats web page with a list of the 19 companies, and hyperlinks to the 19 letters. This page does not reference a letter to Huawei, which makes smartphones. However, this page does list AT&T, which sells Huawei's Impulse. 3/25. On March 20, 2012, the Federal Communications Commission (FCC) adopted and released a Notice of Proposed Rulemaking (NPRM) [108 pages in PDF] regarding the exclusive contract prohibition of the program access rules. See, stories titled "FCC Adopts NPRM on Exclusive Contract Prohibition of Program Access Rules" and "Commentary: Cablevision I and the Exclusivity Rule" in TLJ Daily E-Mail Alert No. 2,352, March 21, 2012. Walter McCormick, head of the US Telecom, stated in a release that "Competition in the market for video services continues to develop, and consumers continue to enjoy numerous choices in terms of better service, newer technologies and lower prices. Revenue from the provision of video services has been shown to be a key driver supporting the economics of deploying robust broadband networks in higher cost areas." But, he continued that "content remains king, and competition will not be able to thrive if cable companies are allowed to withhold certain essential programming, such as regional sports networks that allow consumers to see their favorite local sports teams." McCormick wrote that "Initiating this rulemaking is an important step in ensuring consumers continue to enjoy the benefits of a competitive market." Matthew Polka, head of the American Cable Association (ACA), which represents small cable operators, stated in a release that the "ACA commends the FCC for asking the right questions in the program access NPRM released yesterday. Importantly, the FCC asks whether the program access rules adequately address potentially discriminatory volume discounts, and if not, how to revise the rules to address these concerns." See for example, this ACA comment, beginning at page 17, and this ACA comment. Polka added that "The FCC also seeks comment on whether and how to revise rules that address uniform price increases imposed by vertically integrated, cable operator-owned programmers." The NPRM addresses volume discounts at paragraphs 98-100. This ACA release states that "FCC regulations are flawed because they leave small operators with no more than a few remedies, if that, to combat vertically integrated suppliers of programming that demand discriminatory prices, terms, and conditions, and engage in other types of behavior barred by the rules". The FCC's NPRM is FCC 12-30 in MB Docket No. 12-68, MB Docket No. 07-18 and MB Docket No. 05-192. 3/22. The Senate Judiciary Committee (SJC) held an executive business meeting at which it again held over consideration of the nominations of Richard Taranto to be a Judge of the U.S. Court of Appeals (FedCir), Robin Rosenbaum to be a Judge of the U.S. District Court (SDFl), and Gershwin Drain to be a Judge for the U.S. District Court (EDMich). All three nominees are again on the agenda for the SJC's executive business meeting of Thursday, March 29, 2012. See, notice. 3/22. The Senate confirmed Rudolph Contreras to be a Judge of the U.S. District Court (DC). See, Congressional Record, March 22, at Page S2007. 3/22. The Senate confirmed Ronnie Abrams to be a Judge of the U.S. District Court (SDNY) by a vote of 96-2. See, Roll Call No. 58. 3/22. The Senate confirmed David Nuffer to be a Judge of the U.S. District Court (DUtah) by a vote of 96-2. See, Roll Call No. 57. There will be a two day conference titled "Palmetto Open Source Software Conference". At 10:30 AM on March 29 Doug Maughan (Director of the DHS's Cyber Security Division's Science and Technology Division) will give a presentation titled "Open Security: How DHS is deploying open source software to address national cyber security challenges", and Michael Weinberg (Public Knowledge) will give a presentation titled "Protecting 3D Printing and Open Hardware in Washington, DC". See, conference web site and schedule. Location: Columbia Metropolitan Convention Center, 1101 Lincoln St., Columbia, South Carolina. The Virginia Emergency Management Association (VEMA) will host a three day conference titled "Virginia Emergency Management Symposium". On March 29 Heather Kowalski (DHS NPPD CS&C) will speak on the cell tower system. See, notice. Location: Hilton Richmond Hotel and Spa, Richmond, Virginia. 9:00 AM - 4:00 PM. The Copyright Clearance Center (CCC) will host an event titled "OnCopyright 2012". Registration has closed. The CCC will webcast this event. See, notice. Location: Kernochan Center, Columbia Law School, New York, New York. 10:30 AM - 12:00 NOON. The Federal Communications Bar Association's (FCBA) New York Chapter will host an event. FCC Commissioner Mignon Clyburn will speak. Prices vary. For more information, contact LaVonda Huff at lareed at law dot syr dot edu, Michele Thomas at michele dot thomas at t-mobile dot com, Elise Hiller at ehiller at kleinlawpllc dot com, or Allen Zoracki at azoracki at kleinlawpllc dot com. Location: Albany Law School, West Foyer, 80 New Scotland Ave., Albany, New York. 9:00 AM - 6:00 PM. Syracuse University law school and the Federal Communications Bar Association's (FCBA) New York Chapter will host an event titled "7th Annual Communications Law & Policy Symposium". Location: Syracuse University law school, Syracuse, New York. The House will meet at 12:00 NOON for morning hour, and at 2:00 PM for legislative business. The House will consider several non-technology related items under suspension of the rules. Votes will be postponed until 6:30 PM. See, Rep. Cantor's schedule. The Senate will meet at 2:00 PM. It will resume consideration of S 2204 [LOC | WW], a tax bill pertaining to coal, biofuels, electric vehicles, energy efficiency, and oil companies. 8:30 AM - 4:30 PM. Day one of a four day event hosted by the National Emergency Number Association (NENA) titled "9-1-1 Goes to Washington". See, notice and agenda. Location: L’Enfant Plaza Hotel, 480 L’Enfant Plaza, SW.
8:30 AM - 1:30 PM. The Center for Strategic and International Studies (CSIS) will host an event titled "U.S. Department of Defense Biometric and Forensic Technology Forum". See, notice. Location: CSIS, 1800 K St., NW. 8:30 AM - 5:00 PM. Day one of a five day event hosted by the Department of Homeland Security's (DHS) National Cyber Security Division (NCSD), Department of Defense (DOD), and National Institute of Standards Technology (NIST) titled "16th Semi-Annual Software Assurance (SwA) Forum". On Monday, March 26, there will be tutorials on eXchanging indicators and information for incident response. Free. Registration required. See, notice and agenda. Location: Mitre Corporation, Building MITRE-1, 7525 Colshire Drive, McLean, VA.
TIME CHANGE. 9:30 AM - 3:15 PM. The U.S. China Economic and Security Review Commission will hold a hearing titled "Developments in China's Nuclear and Cyber Programs". The hearing on cyber security will be from 10:00 AM to 12:00 NOON. The witnesses will be Richard Bejtlich (Mandiant), Nart Villeneuve (Trend Micro), and Jason Healey (Atlantic Council). Rep. Frank Wolf (R-VA) will speak sometime during this hearing. See, notice in the Federal Register, Vol. 77, No. 49, Tuesday, March 13, 2012, at Pages 14859-14860. Location: Hylton Performing Arts Center, 10960 George Mason Circle, Manassas, VA.
POSTPONED. 12:30 - 2:00 PM. The Federal Communications Bar Association (FCBA) will host a brown bag lunch titled "The Impact of the New Legislation on Public Safety Communications". Location: Harris Corporation, Suite 850E, 600 Maryland Ave., SW.
5:00 PM. The House Rules Committee (HRC) will meet to adopt a rule for consideration of HR 3309 [LOC | WW], the "Federal Communications Commission Process Reform Act of 2012". See, notice. See, stories titled "House Commerce Committee Approves FCC Reform Bills", "Amendment by Amendment Summary of Mark Up of HR 3309", and "Summary of HR 3309, the FCC Process Reform Act " in TLJ Daily E-Mail Alert No. 2,345, March 6, 2012. Location: Room H-313, Capitol Building. EXTENDED TO APRIL 2. 5:00 PM. Deadline to submit comments to the National Telecommunications and Information Administration (NTIA) in response to its request for comments in its wide ranging private sector data privacy inquiry. The NTIA seeks comments regarding "substantive consumer data privacy issues that warrant the development of legally enforceable codes of conduct, as well as procedures to foster the development of these codes". See, original notice in the Federal Register, Vol. 77, No. 43, Monday, March 5, 2012, at Pages 13098-13101. See also, NTIA's extension notice. Extended deadline to submit reply comments to the Federal Communications Commission (FCC) on Census Block Eligibility Challenges to the FCC's February 2, 2012, Public Notice (DA 12-121) regarding Auction 901 (AU Docket No. 12-25), scheduled to begin on September 27, 2012. This is the FCC's reverse auction to give $300 Million in universal service subsidies to carriers that commit to provide 3G or better mobile voice and broadband services where such service is unavailable. The FCC calls this expansion of universal service programs "Mobility Fund Phase I Support". See also, FCC's February 2, 2012, Public Notice (DA 12-121), and notice in the Federal Register (FR), Vol. 77, No. 28, Friday, February 10, 2012, at Pages 7152-7162; FCC's February 10, 2012, Public Notice (DA 12-187), and notice in the FR, Vol. 77, No. 33, Friday, February 17, 2012, at Pages 9655-9656; and FCC's February 16, 2012, Public Notice (DA 12-236) extending comment deadlines, extension notice in the FR, Vol. 77, No. 37, Friday, February 24, 2012, at Pages 11115-11116. Deadline to submit nominations to the Department of Commerce's (DOC) International Trade Administration (ITA) for membership on the U.S.-India CEO Forum. See, notice in the Federal Register, Vol. 77, No. 28, Friday, February 10, 2012, at Pages 7132-7133. This notice does not set a deadline date. Rather it states, "45 days after publication of this Notice". The House will meet at 10:00 AM for morning hour, and at 12:00 NOON for legislative business. The House will consider the Senate passed version of HR 3606 [LOC | WW], the "Jumpstart Our Business Startups Act" or "JOBS Act", a bill to reduce regulatory barriers to capital formation by small and start up companies. The House will also consider HR 3309 [LOC | WW], the "Federal Communications Commission Process Reform Act of 2012". See, notice. See, stories titled "House Commerce Committee Approves FCC Reform Bills", "Amendment by Amendment Summary of Mark Up of HR 3309", and "Summary of HR 3309, the FCC Process Reform Act " in TLJ Daily E-Mail Alert No. 2,345, March 6, 2012. 8:30 AM - 5:00 PM. Day two of a five day event hosted by the Department of Homeland Security's (DHS) National Cyber Security Division (NCSD), Department of Defense (DOD), and National Institute of Standards Technology (NIST) titled "16th Semi-Annual Software Assurance (SwA) Forum". On Tuesday, March 27, the agenda is "Securing a Mobile World". The opening keynote speakers will include Joe Jarzombek (DHS), John Streufert (Director of the DHS' NCSD), Tony Sager (NSA). There will then be panels titled "Panel on Securing Mobile Operating Systems", "Securing Mobile Applications" and "Acquiring and Operating Secure Mobile Solutions". Free. Registration required. See, notice and agenda. Location: Mitre Corporation, Building MITRE-1, 7525 Colshire Drive, McLean, VA.
9:00 AM - 5:00 PM. Day one of a two day meeting of the Department of Energy's (DOE) Advanced Scientific Computing Advisory Committee (ASCAC). The agenda includes an update on Exascale computing and the Magellan Report for Cloud Computing in Science [170 pages in PDF]. See, notice in the Federal Register, Vol. 77, No. 42, Friday, March 2, 2012, at Page 12823. Location: American Geophysical Union (AGU), 2000 Florida Ave., NW. 9:00 AM. Day two of a four day event hosted by the National Emergency Number Association (NENA) titled "9-1-1 Goes to Washington". See, notice and agenda. Location: L’Enfant Plaza Hotel, 480 L’Enfant Plaza, SW.
10:00 AM. The House Commerce Committee's (HCC) Subcommittee on Oversight and Investigations will hold a hearing titled "IT Supply Chain Security: Review of Government and Industry Efforts". The witnesses will be Gregory Wilshusen (GAO), Mitchell Komaroff (Department of Defense), Gil Vega (Department of Energy), Larry Castro (Chertoff Group), and Dave Lounsbury (The Open Group). See, notice. Location: Room 2123, Rayburn Building. 10:00 AM. The House Science Committee's (HSC) Subcommittee on Technology and Innovation will hold a hearing titled "Fostering the U.S. Competitive Edge". See, notice. Location: Room 2318, Rayburn Building. 10:00 AM. The Senate Judiciary Committee's (SJC) Subcommittee on Immigration, Refugees and Border Security will hold a hearing titled "The Economic Imperative for Promoting International Travel to the United States". The SJC will webcast this event. See, notice. Location: Room 226, Dirksen Building. 12:15 - 1:45 PM. The Federal Communications Commission (FCC) and National Telecommunications and Information Administration (NTIA) will host a lunch will host an event titled "The Road Ahead for Spectrum". It will address the spectrum provisions of HR 3630, [LOC | WW], which President Obama signed into law on February 22, 2012. See, stories titled "House and Senate Negotiators Reach Agreement on Spectrum Legislation", "Summary of Spectrum Bill", and "Reaction to Spectrum Bill" in TLJ Daily E-Mail Alert No. 2,339, February 17, 2012, and story titled "Obama Signs Spectrum Bill into Law" in TLJ Daily E-Mail Alert No. 2,345, February 23, 2011. The speakers will be Bill Lake (Chief of the FCC's Media Bureau), Rick Kaplan (Chief of the FCC's Wireless Telecommunications Bureau), Jennifer Manner (Deputy Chief of the FCC's Public Safety & Homeland Security Bureau), Karl Nebbia (Associate Administrator of the NTIA's Office of Spectrum Management), and Mark Brennan (Hogan Lovells). The price to attend is $17. Lunch will be served. Registrations and cancellations due by 12:00 NOON on Friday, March 23, 2012. The FCBA states that this is an FCBA event. Location: Wiley Rein, 1776 K St., NW. 2:00 PM. The House Foreign Affairs Committee (HFAC) will meet to mark up bills, including HR 3605 [LOC | WW], the "Global Online Freedom Act of 2011". See, notice. Location: Room 2172, Rayburn Building. 6:00 - 9:15 PM. The DC Bar Association will host an event titled "How to Protect and Enforce Trademark Rights". The speakers will be Steven Hollman (Hogan Lovells) and Shauna Wertheim (Marbury Law Group). The price to attend ranges from $89 to $129. CLE credits. See, notice. For more information, call 202-626-3488. The DC Bar has a history of barring reporters from its events. Location: DC Bar Conference Center, 1101 K St., NW. The House will meet at 10:00 AM for morning hour, and at 12:00 NOON for legislative business. 8:30 AM - 5:00 PM. Day three of a five day event hosted by the Department of Homeland Security's (DHS) National Cyber Security Division (NCSD), Department of Defense (DOD), and National Institute of Standards Technology (NIST) titled "16th Semi-Annual Software Assurance (SwA) Forum". On Wednesday, March 28, the agenda is "Designed-in Security". The opening speakers will include Douglas Maughan (DHS). There will then be panels titled "Designed-In Security Enabling Trustworthy Cyberspace", "Education and Training Programs Relevant to Software Assurance" and "SwA Initiatives Supporting the Blueprint for a Secure Cyber Future". Free. Registration required. See, notice and agenda. Location: Mitre Corporation, Building MITRE-1, 7525 Colshire Drive, McLean, VA.
9:00 AM. Day three of a four day event hosted by the National Emergency Number Association (NENA) titled "9-1-1 Goes to Washington". At 11:00 AM there will be a panel comprised of Congressional committee staff. At 12:00 NOON Jamie Barnett, Chief of the FCC's Public Safety and Homeland Security Bureau, will give a lunch speech. See, notice and agenda. Location: L’Enfant Plaza Hotel, 480 L’Enfant Plaza, SW.
9:00 - 10:30 AM. The Information Technology and Innovation Foundation (ITIF) will host a panel discussion titled "Transforming Higher Education with IT". The speakers will be Robert Atkinson (ITIF), Stephen Ruth (George Mason University's School of Public Policy), and Steve Crawford (George Washington University's Institute of Public Policy). See, notice. Location: ITIF/ITIC: Suite 610, 1101 K St., NW. 9:00 AM - 12:00 NOON. Day two of a two day meeting of the Department of Energy's (DOE) Advanced Scientific Computing Advisory Committee (ASCAC). The agenda includes an update on Exascale computing and the Magellan Report for Cloud Computing in Science [170 pages in PDF]. See, notice in the Federal Register, Vol. 77, No. 42, Friday, March 2, 2012, at Page 12823. Location: American Geophysical Union (AGU), 2000 Florida Ave., NW. 10:00 AM. The House Judiciary Committee's (HJC) Subcommittee on Crime, Terrorism, and Homeland Security will hold a hearing on several bills, including HR 4216 [LOC | WW], the "Foreign Counterfeit Prevention Act", and HR 3668 [LOC | WW], the "Counterfeit Drug Penalty Enhancement Act of 2011". See, notice. Location: Room 2141, Rayburn Building. 10:00 AM. The House Commerce Committee's (HCC) Subcommittee on Communications and Technology will hold a hearing titled "Cybersecurity: Threats to Communications Networks and Public-Sector Responses". The witnesses will be Fiona Alexander (National Telecommunications and Information Administration), James Barnett (Chief of the FCC's Public Safety and Homeland Security Bureau), Bob Hutchinson (Sandia National Laboratories), Greg Shannon (CERT, Carnegie Mellon University), and Roberta Stempfley (acting DHS Assistant Secretary for Cyber Security and Communications). See, notice. Location: Room 2322, Rayburn Building. 10:00 AM. The House Foreign Affairs Committee (HFAC) will hold a hearing titled "Investigating the Chinese Threat, Part One: Military and Economic Aggression". The witnesses will be Dean Cheng (Heritage Foundation), John Tkacik (International Assessment and Strategy Center), and Larry Wortzel (Commissioner, US-China Economic and Security Review Commission). See, notice. Location: Room 2172, Rayburn Building. 12:15 - 1:30 PM. The Federal Communications Bar Association's (FCBA) Homeland Security and Emergency Communications Committee will co-host a lunch. The speaker will be Jamie Barnett, Chief of the FCC's Public Safety and Homeland Security Bureau. This lunch is a part of the National Emergency Number Association (NENA) four day conference titled "9-1-1 Goes to Washington". Location: Monet Ballroom, L’Enfant Plaza Hotel, 480 L'Enfant Plaza, SW.
1:00 - 2:00 PM. The National Science Foundation's (NSF) National Science Board's (NSB) Committee on Strategy and Budget Task Force on Data Policies will meet to discuss "data policies". The meeting will be teleconferenced. See, notice in the Federal Register, Vol. 77, No. 50, Wednesday, March 14, 2012, at Page 15141. Location: Federal Register, Vol. 77, No. 50, Wednesday, March 14, 2012, at Page 15141. Location: 4201 Wilson Blvd., Arlington, VA.
1:00 - 4:00 PM. The Federal Communications Commission's (FCC) Technological Advisory Council will meet. See, notice in the Federal Register, Vol. 77, No. 42, Friday, March 2, 2012, at Page 12839. Location: FCC, 445 12th St., SW.
2:00 PM. The House Appropriations Committee's (HAC) Subcommittee on Financial Services and General Government will hold a hearing on the FY 2013 budget for the Judiciary. See, notice. Location: Room 2359, Rayburn Building. 2:30 PM. The House Foreign Affairs Committee's (HFAC) Subcommittee on Oversight and Investigations will hold a hearing titled "The Price of Public Diplomacy with China". The witnesses will be Steven Mosher (Population Research Institute), Kai Chen, and Greg Autry. See, notice. Location: Room 2172, Rayburn Building. 8:30 AM - 5:00 PM. Day four of a five day event hosted by the Department of Homeland Security's (DHS) National Cyber Security Division (NCSD), Department of Defense (DOD), and National Institute of Standards Technology (NIST) titled "16th Semi-Annual Software Assurance (SwA) Forum". On Thursday, March 29, there will be a Static Analysis Tool Exposition (SATE) workshop. Free. Registration required. See, notice and agenda. Location: Mitre Corporation, Building MITRE-1, 7525 Colshire Drive, McLean, VA.
9:00 AM - 4:00 PM. Day four of a four day event hosted by the National Emergency Number Association (NENA) titled "9-1-1 Goes to Washington". This day is set aside for "Hill Visits". See, notice and agenda. Location: L’Enfant Plaza Hotel, 480 L’Enfant Plaza, SW.
9:30 AM - 2:00 PM. The Federal Communications Commission's (FCC) North American Numbering Council (NANC) will meet. See, notice in the Federal Register, Vol. 77, No. 42, Friday, March 2, 2012, at Pages 12839-12840. Location: Room 5-C162, FCC, 445 12th St., SW.
9:30 AM. The Senate Judiciary Committee (SJC) will hold an executive business meeting. The agenda again includes consideration of the nominations of Richard Taranto to be a Judge of the U.S. Court of Appeals (FedCir), Robin Rosenbaum to be a Judge of the U.S. District Court (SDFl), and Gershwin Drain to be a Judge for the U.S. District Court (EDMich). The SJC will webcast this event. See, notice. Location: Room 226, Dirksen Building. 10:00 AM. The House Commerce Committee's (HCC) Subcommittee on Commerce, Manufacturing and Trade will hold a hearing tilted "Balancing Privacy and Innovation: Does the President's Proposal Tip the Scale?". See, notice. Location: Room 2123, Rayburn Building. 10:00 AM - 5:00 PM. The Commodity Futures Trading Commission's (CFTC) Technology Advisory Committee will meet. The agenda includes "automated and high frequency trading, final recommendations of the subcommittee on data standardization, and market structure and technology issues relating to credit limit checks". Written comments are due by March 28. See, notice in the Federal Register, Vol. 77, No. 52, Friday, March 16, 2012, at Page 15737. Location: CFTC, Three Lafayette Centre, 1155 21st St., NW. 1:00 PM. The Office of the U.S. Trade Representative (OUSTR) will hold a hearing to assist it in preparing its 2011 Annual GSP Product Review. The hearing will cover only the petitions for new products and CNL waivers that have been previously submitted and accepted for review in the 2011 GSP Annual Review. Post hearing comments are due by 5:00 PM on April 16, 2012. See, original notice in the Federal Register, Vol. 77, No. 34, Tuesday, February 21, 2012, at Pages 10034-10036. See also, notice of change of date in the Federal Register, Vol. 77, No. 52, Friday, March 16, 2012, at Page 15841. Location: OUSTR, 600 17th St., NW. TIME? The U.S. China Economic and Security Review Commission will hold a hearing titled "European Union Relations and Implications for the U.S.". Location: :__. Rep. Cantor's schedule states that "no votes are expected in the House". 8:30 AM - 5:00 PM. Day five of a five day event hosted by the Department of Homeland Security's (DHS) National Cyber Security Division (NCSD), Department of Defense (DOD), and National Institute of Standards Technology (NIST) titled "16th Semi-Annual Software Assurance (SwA) Forum". Free. Registration required. See, notice and agenda. Location: Mitre Corporation, Building MITRE-1, 7525 Colshire Drive, McLean, VA. RESCHEDULED FOR APRIL 13. 12:00 NOON - 1:00 PM. Federal Communications Commission (FCC) Commissioner Robert McDowell will speak. Free. Brown bag lunch. The FCBA states that this is an FCBA event of its Young Lawyers Committee. Location: FCC, 8th floor South Conference Room, 445 12th St., SW.
Possible date for the Office of the U.S. Trade Representative (OUSTR) to release its annual report titled "National Trade Estimate Report on Foreign Trade Barriers". Deadline to submit nominations for the National Medal of Technology and Innovation (NMTI) to the U.S. Patent and Trademark Office (USPTO). See, notice in the Federal Register, Vol. 77, No. 9 Friday, January 13, 2012, at Pages 2047-2048. For more information about this program, see stories titled "Bush Awards National Medals of Technology and Science", "House Democrats Promote Their Innovation Agenda", and "Commentary: National Medal of Technology Program" in TLJ Daily E-Mail Alert No. 1,312, February 17, 2006. The Senate will not meet on the week of Monday, April 2, through Friday, April 6, or on the week of Monday, April 9, through Friday, April 13. EXTENDED FROM MARCH 26. 5:00 PM. Deadline to submit comments to the National Telecommunications and Information Administration (NTIA) in response to its request for comments in its wide ranging private sector data privacy inquiry. The NTIA seeks comments regarding "substantive consumer data privacy issues that warrant the development of legally enforceable codes of conduct, as well as procedures to foster the development of these codes". See, original notice in the Federal Register, Vol. 77, No. 43, Monday, March 5, 2012, at Pages 13098-13101. See also, NTIA's extension notice.